End of the road. A popular businessman in Ifon, Osun State, identified as Supo Bamidele has been arrested in possession of fresh human head, two hands, and three human flesh, properly wrapped inside a polythene sack in Ondo road, Ile Ife. The 'big man' confessed that he dug a grave at a cemetery in Ifon community and cut the head and palms of a corpse there. Bamidele said his herbalist asked him to bring a human head and two palms to help him do money ritual, but the man denied the claim by the businessman. 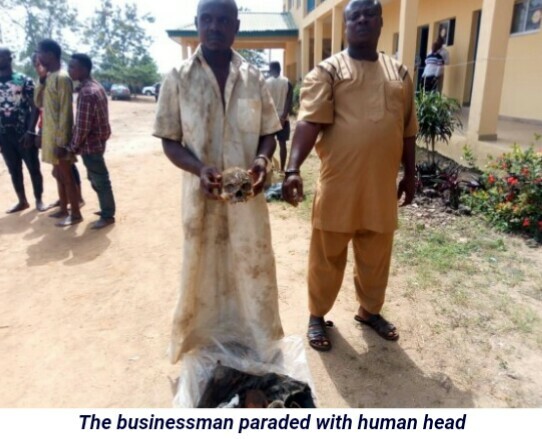 The businessman and his herbalist, Amos Suleiman were arrested by the police for being in possession of the human parts.